Barbara Kaija New Vision Editor in chief. There is a loom war at the 1st street industrial area based newsrooms as new guidelines issued today by Managing Editor Ben Opolot bars sub-editors from going for lunch due to time constraints. The new guidelines have left many in tears as to why they have been selected out and yet there are many of their colleagues in Kirussia who are redundant and can easily step in for sub-editors if it is lunch time. “We think this policy is discriminating and possibly it is a way of saying the company can no longer meet our lunch expenses. 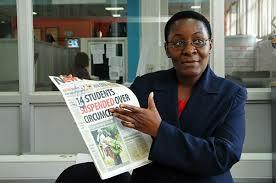 How come this policy isn’t targeting editors as well?” said a sub-editor from New Vision. Please ensure you record, in YOUR BIG BOOK, the time the content comes to you and the time the sub delivers a ready page. Please also note that the subs on the news pages—regional and national—are expected to arrive for work at 12 noon and are not expected to leave the desk for lunch, which they should have had before clocking in. In that case, the regional news pages must be out of the way latest by 3:00pm as instructed by the EIC in the meeting this morning. The reason for this reminder is to help push all stakeholders in the news value chain—contributing and product editors and writers—to meet deadlines, the poor management of which continues to disadvantage our copy sales performance.